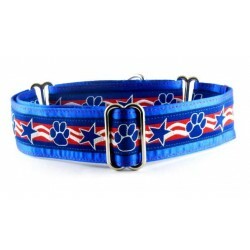 Nautical and Americana collars for the patriotic pooch. Red, white, and blue are in colors all year long. 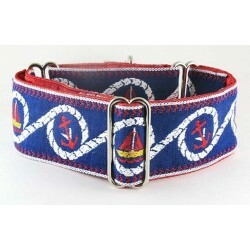 Nautical/Americana There are 25 products. 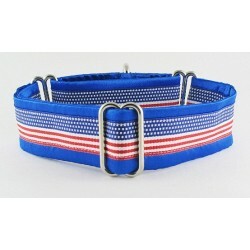 American Flag Royal martingale or snap-relase buckle dog collar covered with a patriotic, flag design. 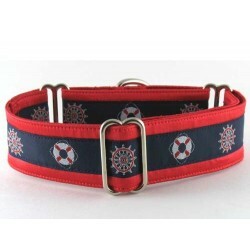 Anchors Away martingale or snap-relase buckle dog collar decked out with a red, white and blue anchor pattern. 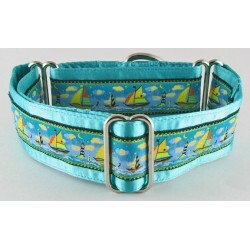 Aqua Sloop martingale or snap-relase buckle style dog collar decked out in a unique sailboat trim with appealing dimension. 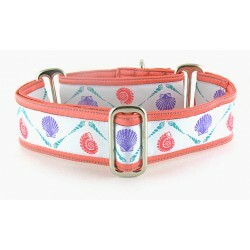 Beachin' It martingale or snap-relase buckle dog collar featuring a beach chair and umbrella seashore design. 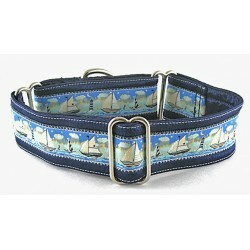 Cape Cod martingale or snap-relase buckle dog collar spotlighting a New England Style lighthouse theme. 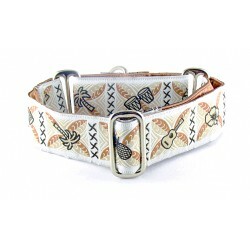 Nantucket martingale or snap-buckle dog collar. 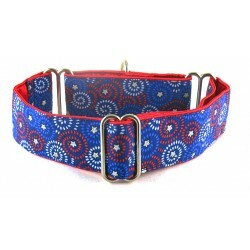 Predominate colors of red, white and blue with a touch of yellow adorn this seafaring collar. 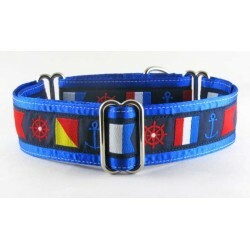 Navy Sloop martingale or snap-relase buckle style dog collar outfitted with a detailed nautical theme. 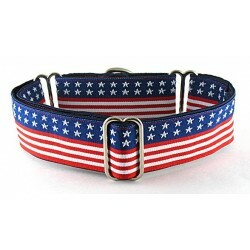 Old Glory martingale or snap-relase buckle style dog collar respectively wearing the Stars and Stripes. 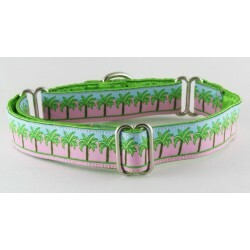 Palm Parade martingale or snap-relase buckle style dog collar embellished with tropical trees and ocean colors. 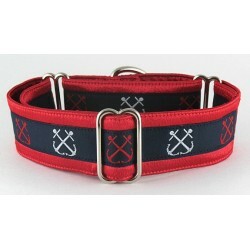 Regatta martingale or snap-relase buckle style dog collar decked out in a engaging marine trim. 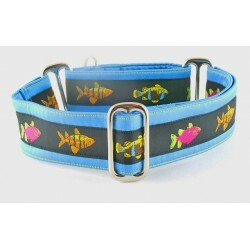 Something is Fishy a martingale or snap-release buckle dog collar displaying colorful tropical fish swimming in a row. 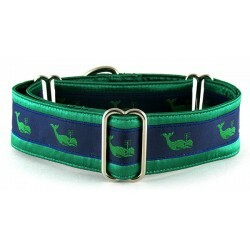 Spouty Whale, a martingale or snap-relase buckle dog collar displaying a woven green whale on a navy blue background. 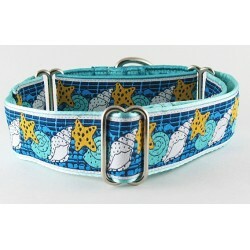 Star Shell martingale or snap-release buckle collar sporting a seashore theme of starfish and shells. 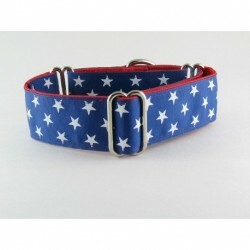 Star Spangle Blue martingale or snap-relase buckle dog collar sprinkled with white stars on dark blue. 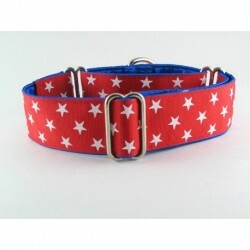 Star Spangle Red martingale or snap-relase buckle dog collar sprinkled with white stars on red. 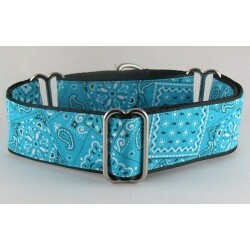 Turquoise Bandana martingale or snap-buckle dog collar. A timeless, traditional look for those casual days. 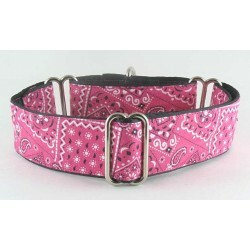 Two Step a martingale or snap-release buckle dog collar attired with a fun Western Theme. 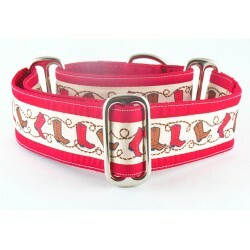 Red and Brown cowboy boots dance around on a tan background, surrounded by a matching rope design.